Two-wheeler parking can be very very space-efficient! More than TEN times more space-efficient than car parking, in fact. I measured this for myself in Indonesia recently. I have mentioned before that, in some countries, cars take ten times the parking space as motorcycles. This means charging motorised two-wheelers parking charges 1/2 the four-wheeler rate (as is common in Asia) seems rather unfair. It also means that Park-and-Ride for motorcycles (or bicycles of course!) is much, much, MUCH more space-efficient than Park-and-Ride for cars (about which I often urge great caution). Indian cities considering park-and-ride at mass transit stations please take note! It shows measurements from Bogor (done with help from Aldi and Qi from GIZ SUTIP). 56 motorcycles parked on 90 square metres of asphalt (1.6 square metres per motorcycle). We did not measure space for turning at the end of aisles. This is much larger for cars obviously, so these results underestimate the difference between motorcycles and cars. On the other hand, you might argue that cars in Indonesia tend to be larger than in most countries and that their motorcycles are typically small. Anyway, clearly the space-efficiency difference is dramatic. It is huge! The park-and-ride lot at Bogor railway station on a Monday morning. Bogor is about 60 km south of central Jakarta. It is a terminus for the Jakarta metropolitan region's electric suburban rail system which offers a fast (but very crowded) commuting option for people working in central Jakarta. A nearby street is also crammed with motorcycle park-and-ride businesses charging a little less than the official lot. What about bicycles? They are obviously space-efficient with various numbers claimed as the bicycle to car ratio. I didn't measure it but this scene from Tokyo suggests that bicycle parking can be about as space efficient as motorcycle parking, and maybe more efficient. Paid bicycle parking at a Tokyo subway station. Walkway parking: a problem almost everywhere? 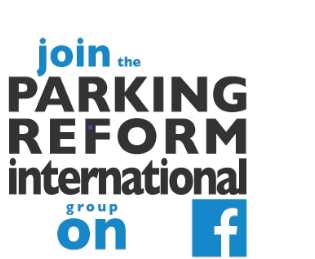 Don't forget that some small economies for car parking can be gotten if stacked parking is considered. Certainly, Dave. And the same applies for bicycles. I haven't heard of stackers for motorcycle parking (although I wouldn't be surprised to hear that Taipei has such a thing!). 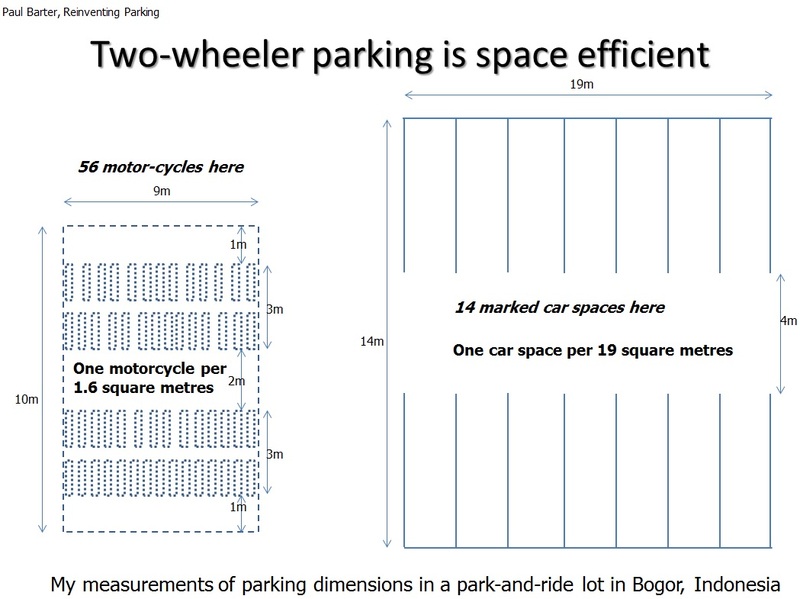 But, of course, even halving the space needed per car leaves four-wheelers way more space using than two-wheelers. For Park-and-Ride, maybe the station-car concept is a more promising way to reduce parking space consumption at mass transit? You would know better than me if there really is much potential there. 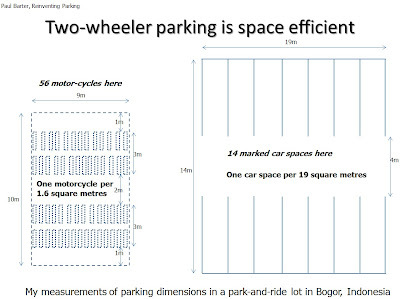 I did some back-of-the-envelope calculations myself a while ago (assuming maximum occupancy) and came to the conclusion that a bicycle is 60 times more space efficient than a car! Sixty!! I'm currently studying the parking space requirement in this Bogor Station and your data is very helpful. Parking? You work on parking? Why?